When I was released from Cub Scouts and as a primary teacher I was called as the Nursery leader. One day I'll post what I have started in there, but several months later I still feel like there is so much to do/learn! My first nursery post is going to be about the kits I made them for General Conference this coming weekend. 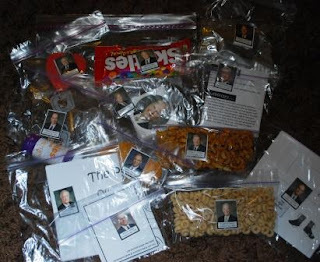 Last year I found an idea in which you stick a picture of the prophet or apostles on a bag and when that person was speaking in General Conference the kids were able to do/eat whatever is in that bag. 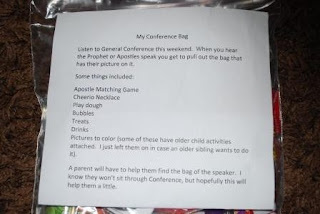 I found it right before conference and threw it together (not completely) for my kids. This year I hope to make it a little more complete. I decided to do something similar for my nursery kids (right now we only average 4-6 kids, but that will change shortly)! 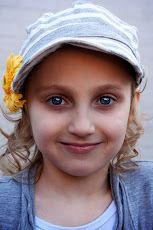 I found this awesome site that had all the pictures I needed sized to print on labels. The only downside is that I didn't have labels and of course I remembered Saturday night that if I was going to give out something for Conference it would have to be the following day so I just printed them onto regular paper, cut them out, and used packaging tape to tape them onto baggies (both snack size and sandwich size). Inside the baggies I put pictures to color (I used some from here, but I later I think printing some from the nursery manual would have probably been better for this age. My internet was BARELY working so I wasn't able to search around for other pages), treats, or activities. The activity bags included: a bag with dental floss & cheerios so they could make a necklace (I tied one cheerio onto the end so it was ready to go), a matching game - I printed two copies of this Bingo game made for toddlers. 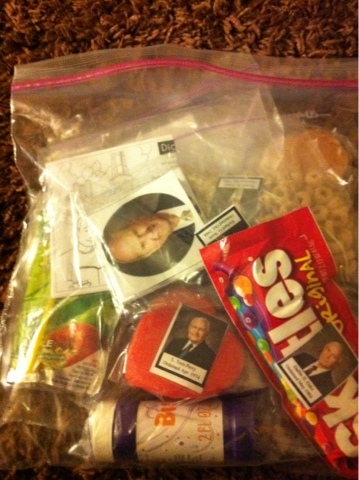 I cut out the pictures using the lines as guides & put them into a bag to be used as a matching game (there were nine pictures per game so they didn't have all the apostles), home-made play dough I had leftover from these Valentine's cards, and bubbles (I put this in President Monson's so the parents could choose to blow it a few times every time he spoke or just give it to them the first time he spoke). I also had snacks: Capri sun, teddy grahams, Nilla Wafers, pretzels, skittles. I put it all in a gallon size Ziploc bag and included a note so the parents knew what it was all about. I introduced it to the kids and told them they had to wait until conference before they could open it. Hopefully it'll make conference a little more exciting for those small, but oh so bright spirits! Sorry for the pictures. The one of the items in the bag was taken with my phone. The others are in a kit that isn't complete, but it will show you what I did. We are missing large heart marshmallows, another coloring page, and a bag of teddy grahams. Hopefully the activities and food will be spread out! Thanks for the comment. Now that I'm out of school for awhile I hope to have more posts up soon! OH OH I love this idea too!!! 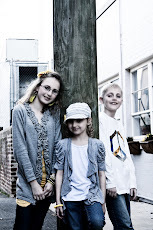 Come post on my blog!!! 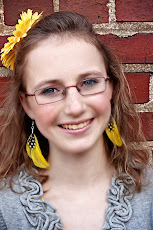 I'm hosting a "General Conference Linky Party" from now until October 4th. I'd love it you'd join in on the fun! How fun! The kids will love them! I found this idea too and it has changed my life. Well, it has changed my General Conference experience at least. 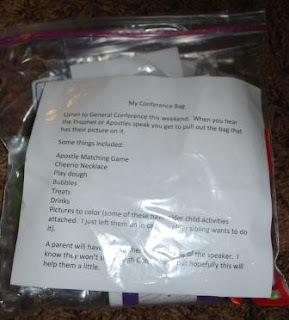 I have posted a bunch of toddler and preschool activities to put into bags on my blog. I will add a link to your ideas, too because they are great ideas! 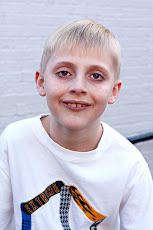 Hi, nice information thanks for sharing with us. Good one post.Thanks to share this information. Thanks for sharing such kind of nice and wonderful collection. I love reading your posts. Great idea! Love it! Pinning!